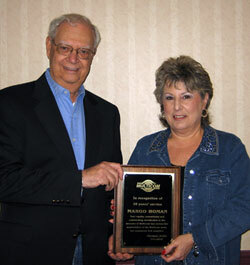 Orlando, FL – December 2009 – Multicom honored Margo Homan for 20 years of service at the recent 27th Annual Multicom Holiday Celebration. She was presented with an Outstanding Service Achievement Award and a diamond necklace. Appreciation was expressed for many years of extraordinary dedication, diligence, and accomplishment serving Multicom’s customers, supporting the Multicom team in a wide variety of roles, and helping with the drive to success that Multicom has now achieved. “Margo’s loyalty, commitment, and outstanding contribution to the success of Multicom has earned the appreciation of the Multicom team, our customers, and our suppliers.” said Sherman G. Miller Multicom’s President and CEO.